S.S. United States saved from the blowtorch, for now. This is old news, and I've been meaning to post about it for about two weeks, but life has been hectic. 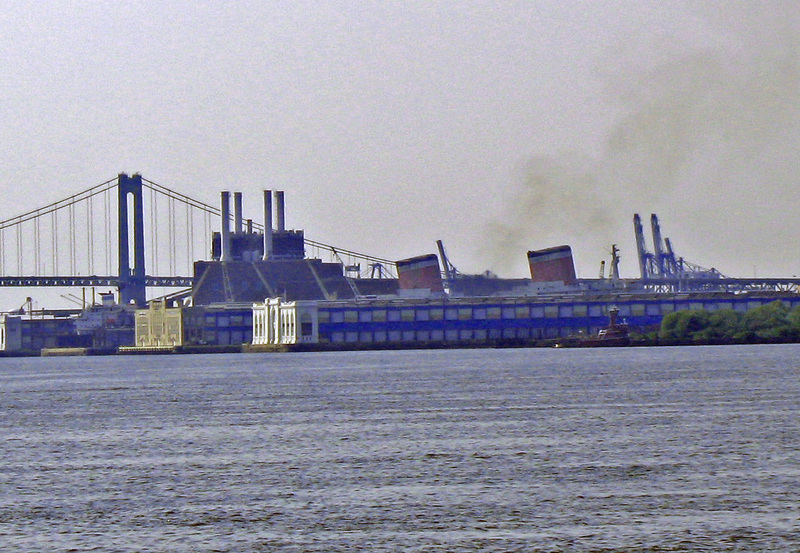 Those two jauntily raked red, white, and blue funnels you see in the photo above (click to enlarge), taken during a visit to Philadelphia in 2006, belong to the S.S. United States, the sleekest, fastest transatlantic passenger liner ever. Launched in 1952, as the Korean War raged and the Cold War between the U.S. and U.S.S.R. grew more frigid, she was a joint venture between her commercial operator, United States Lines, and the U.S. Navy, which funded the majority of her construction cost and held the right, in the event she was needed, to take her for use as a high speed, high capacity troopship or hospital ship. On her maiden Atlantic voyage, the "Big U", as she came to be known, set new speed records for both the east and west bound crossings. She thereby claimed the Blue Riband, awarded to the fastest liner on the transatlantic route. 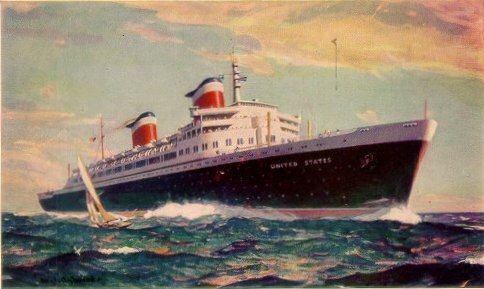 She still held it when she was retired from service in 1969, and it retired with her, as the age of regular transatlantic passenger ship service had ended. Since then, she has been idle, for a time at Newport News, Virginia, where she was built; later at Philadelphia. Norwegian Cruise Lines bought her and planned to convert her to cruising, but turning an ocean thoroughbred into a carriage horse is tricky. As years passed and her condition deteriorated, it seemed more and more likely she would go for scrap. As Oliver Wendell Holmes wrote in "Old Ironsides", his impassioned poem protesting a plan to break up the frigate Constitution: "The harpies of the shore shall pluck/ The eagle of the sea." A group of people determined not to allow this to happen formed the S.S. United States Conservancy to raise funds for the ship's restoration and preservation, and to publicize her plight. Susan Gibbs, granddaughter of William Francis Gibbs, principal designer of the ship, serves as its president. 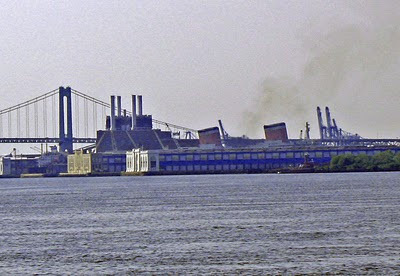 In 1999, a predecessor organization to the Conservancy succeeded in having the ship listed in the National Register of Historic Places; nevertheless, this did not guarantee that it would be preserved. Fortunately, with funds pledged by Philadelphia philanthropist H.L. "Gerry" Lenfest, the Conservancy has purchased the ship as of the first of this month, and has sufficient funds to maintain her for twenty months. The Conservancy must also find a permanent home for the "Big U", with New York in the running, along with Philadelphia and Miami. Naturally, I'm hoping she returns to New York, her home port. Egypt: what kind of democracy? Yesterday's New York Times op-ed page includes a piece by Essam El-Errian, a member of the Guidance Council of Egypt's Muslim Brotherhood, with the title "What the Muslim Brothers Want". It includes many reassuring (to those of us who want to see Egypt emerge from its crisis as a robust democracy) declarations: "we have persistently demanded liberation and democracy"; "the Muslim Brotherhood is committed to...reform and progress"; and, most significantly, "We aim to achieve reform and rights for all: not just for the Muslim Brotherhood, not just for Muslims, but for all Egyptians." As our nation heads toward liberty, however, we disagree with the claims that the only options in Egypt are a purely secular, liberal democracy or an authoritarian theocracy. Secular liberal democracy of the American and European variety, with its firm rejection of religion in public life, is not the exclusive model for a legitimate democracy. I'm heartened by Mr. El-Errian's evident rejection of "authoritarian theocracy" (which I take to mean no imposition of Sharia as civil law); but I claim a misunderstanding because he characterizes American and European democracies as having strictly excluded religion from the public sphere. In America, religious references abound both in our governmental ceremonies (yes, nonbelievers and religious objectors--there are those--are given the opportunity to omit references to God or "affirm" rather than to "swear"), and, more importantly, in our political discourse. Our First Amendment prohibits the establishment of a particular religion, but in its succeeding clause guarantees the right to "free exercise" of religious beliefs. This point is also made in a letter, published in today's Times, by Regan McCarthy in response to Mr. El-Errian's column (see here). European democracies offer even stronger counterexamples. Britain, for instance, still has an established church, and the Archbishop of Canterbury, who is formally appointed by the monarch, takes part in ceremonies of state. Nevertheless, adherents to faiths other than that of the Church of England are allowed to practice their religion, and no one, including nonbelievers, is excluded from public life, including the holding of office. Also troubling to me is Mr. El-Errian's apparent rejection of "liberal" democracy. I'm sure what he means by "liberal" is not what that has come to mean in American political discourse, i.e. the belief that government should intervene in the economy to prevent abuses of private power and to maintain a strong social safety net, but rather the classic meaning, which is that the establishment and preservation of individual liberty should be the fundamental principle (for more discussion of this, see "Genghis Khan: the first liberal?"). In conclusion, despite Mr. El-Errian's encouraging words, I'm perplexed as to what role he proposes for religion in public life, and what scope he is willing to allow for individual freedom. Update: Aljazeera English has just reported Mubarak's resignation.